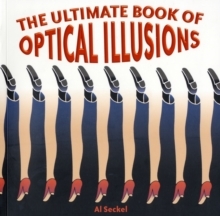 Inside the covers of this incredible, colourful collection are hundreds of the world’s most powerful optical illusions. Some of the mind-boggling images seem to spring into action, vibrating, pulsing, and spinning like a hula hoop. Other ambiguous illusions feature two subjects in one and images like “The Impossible Terrace,” which couldn’t exist off the page: just try to figure out if you’re viewing the space from above or below.